College football is getting real, folks. In this week’s podcast, I discuss the scenarios for all the top teams. Ohio State isn’t a lock. 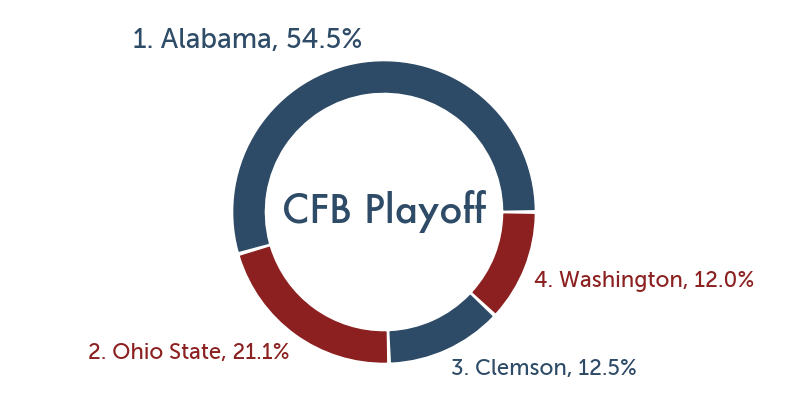 There just aren’t any locks in sports, although it is highly likely the Buckeyes make the playoff. Michigan isn’t dead. But they do need help, and maybe more than you think. Then I transition to the NFL to discuss the Atlanta Falcons, the surprising top team in my member NFL rankings. We shall see how long they last there. Last but not least, I look at the Washington Redskins and their potent offense. They have an interesting game at Arizona this week. This week, I focus on Michigan at Ohio State, a critical game in the college football playoff picture. After looking at all the numbers, the game boils down to which team can run the ball, because both teams will find it extremely difficult to throw. I end with a prediction for Michigan at Ohio State, and then jump into college football upset alert. You might laugh at one of the picks, but hey, I’m here to entertain. I end with a college football total that just might make one of our picks in the prediction service. To listen here, click on the play button. When I post my public predictions, my computer ranks the games by quality of teams and predicted closeness of outcome. It’s a viewer’s guide that highlights good teams in close games. This week, Nebraska at Ohio State filtered up to the top, with a prediction of an Ohio State win by 8.4 points. That spread is too low. The predictions comes from team rankings based on margin of victory adjusted for strength of schedule. Each week, you can find the latest rankings here. Nebraska has played well this season, as they lost their first game to Wisconsin this past week. The Cornhuskers rank a solid 14th. Ohio State started the season strong but has stumbled the past two weeks with a loss at Penn State and an unexpectedly close win over Northwestern. This stumble has dropped the Buckeyes from 2nd to 7th in the public team rankings. Still, a 8.4 point spread isn’t enough. Margin of victory is a noisy indicator of team strength when looking at small sample size of 8 or so games. Let’s look at other methods for rankings teams to reveal more insight into Nebraska at Ohio State. At The Power Rank, I also rank teams based on yards per play, a powerful efficiency metric that measures how well an offense can move the ball or a defense can prevent this movement. After adjustments for schedule, Ohio State and Nebraska rank 7th and 40th respectively. This season, I also started using data from the markets to rank football teams. This uses the closing spread in games and adjusts for strength of schedule. Here, Ohio State and Nebraska rank 2nd and 29th respectively. My prediction for members is much closer to the 17 points set by the markets as of Tuesday morning. There might be some value in taking Nebraska at that number, but it feels wrong to go against the talent of Ohio State. You can see all my public college football predictions for week 10 here. If you need my most accurate predictions, consider becoming a member of The Power Rank.